Rohit Sharma and Virat Kohli will be up against each other. 11.59 pm: That’s a wrap for now, folks. Did this match set the tone for the week? It’s your call. Do stick around for all the post-match press conference reports, analysis, videos and much. We hope you enjoyed our coverage today as much as we enjoyed bringing it to you. 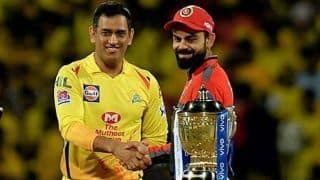 It’s Kings XI Punjab hosting Rajasthan Royals tomorrow and all eyes will be on that match, you know what happened in the reverse fixture, right? Ooops, did any talks about the Mankad dimisssal? 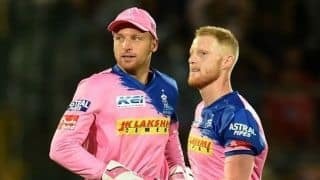 Yes, here’s our preview (READ: All eyes on Ashwin vs Buttler as Royals seek revenge against faltering KXIP) From all of us here, it’s goodnight! Summary: RCB did snap a six-match losing streak, but it looks like they’re gone back to square one. 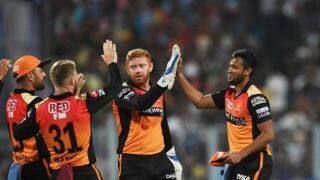 While they did put up a fight, their bowlers failed to capitalise on the pressure moments. It’s safe to say now that it’s all over for RCB. Pawan Negi was not upto the mark tonight, he bowled a really poor penultimate over. The pacers Siraj and Umesh Yadav were terrible. From MI’s perspective, Hardik was great under pressure, but he was brilliant in the end. Credit to Ishan Kishan for the way he counter-attacked and got three crucial sixes that kept MI going. 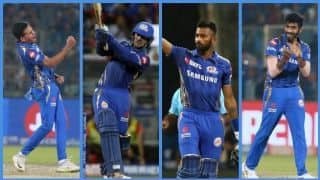 Good finish by MI, but they can do better! This kind of hitting is exactly what is expected of Hardik in the World Cup. Been consistent this season. poor bowling in the power play cost RCB this game. 19th over: Pawan Negi has come back into the attack. MI need 22 from the last 2 overs. BOOM! 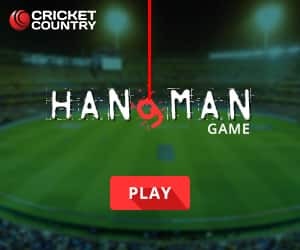 It was just a matter of time before Hardik Pandya breaks the shackles, hammers this straight down the ground for a SIX and follows it with a BOUNDARY. Hardik has killed this match, he smashes another one, Mumbai Indians on the road to victory here. Chahal finishes his quota. 4-0-25-2. Well bowled, Yuzi! Wonderful cricket. Ball tuning square. Enough bite. Two young players taking them on with excellent footwork…. Summary: RCB have made a meal of it at the end. They would definitely wanted a stronger finish specially after the platform AB de Villiers and Moeen Ali gave them. Lasith Malinga and Jasprit Bumrah pulled things back significantly as the last four overs went for just 35 runs. 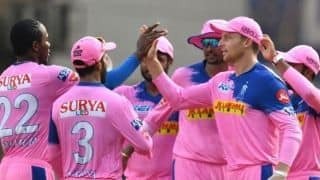 RCB looked towards heading in an excess of 180, but some excellent death over bowling from Malinga and Bumrah meant that RCB fell short by at least 10-15 runs. Note Malinga’s figures here, he finishes with four wickets for just 31 runs in his four overs, while Bumrah remained wicketless and concedes just 22 runs that included 1 maiden in his four overs. A 172-run target should be quite easy at the Wankhede. The MI run-chase in a few moments from now. Stick around. Strategic timeout! And a much needed one for Mumbai Indians. 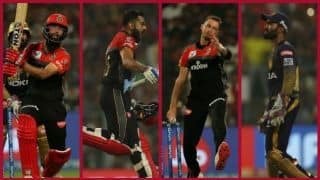 Moeen Ali and AB de Villiers have done an incredible job for RCB. The partnership now between these two is 87, and ABD, once looking scratchy, is well set. Really impressive from Rahul Chahar. Easy action, good pace and nip, very good leg break. Lots to look forward to. Manjrekar reacting to Rahul Chahar: That was a wrong 'un that actually came back in. AB comes down the pitch but can only strike that ball towards long on for a single. 11 overs up, 81-2 on the board. Four. AB breaks the shackles with a boundary over the inner-circle. 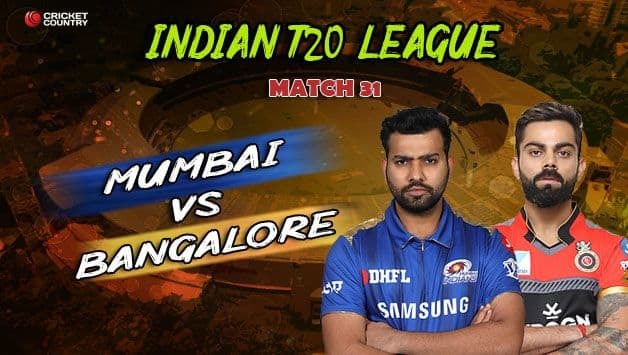 7.30 pm: TOSS: Rohit Sharma has won the toss and Mumbai Indians elect to field. 7.23 pm: PITCH REPORT: “There is an even covering of grass on the wicket. The average first innings score at Wankhede is 192. So, a high scoring ground and there will be dew as well. Both teams would want to bat second here,” says reckons Mpumelelo Mbangwa. 7.17 pm: Both the teams have arrived at the Wankhede Stadium. TOSS in a few minutes from now. 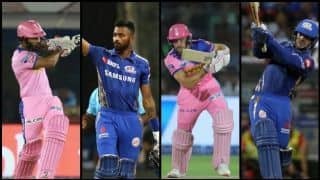 7.15 pm: While RCB have tasted their first win of the season, MI’s campaign has been a bumpy ride so far and both sides cannot afford to take it lightly with the tournament having crossed its halfway mark. Add to that the Wankhede pitch makes tonight’s contest a run fest! 6.40 pm: Coming back to the IPL, here’s some STATS to get you in the mood for tonight’s Monday madness! Rohit Sharma hasn’t scored a fifty in his last 13 innings, the longest for him playing for MI. Jasprit Bumrah has taken more wickets against RCB than any other opposition, 16 wickets and counting. He has dismissed both Kohli and AB de Villiers twice each. 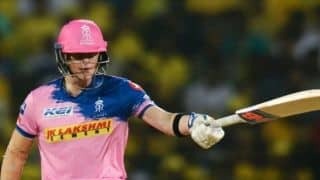 6.25 pm: Both sides will not want to tinker with their combinations, but MI may be forced to make one change after young West Indies pacer Alzarri Joseph landed badly on his shoulder while fielding. 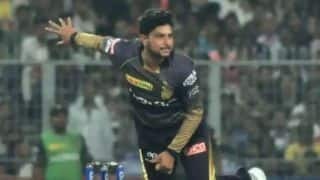 (READ: Joseph joins growing injury list, likely to miss remainder of IPL) If Alzarri, fails to pass the fitness test, then Lasith Malinga could take his spot. 6.20 pm: There’s a famous adage that goes like this: One swallow cannot make an summer. 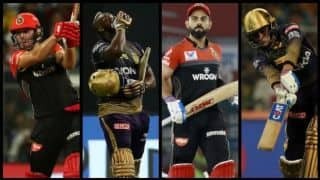 The same holds true for Virat Kohli-led Royal Challengers Bangalore (RCB), who opened their account after six losses, but now need to carry the momentum against Mumbai Indians at the latter’s den. RCB are facing a team that knows a thing or two about comeback. Sit back, grab some coffee and enjoy this one, it’s Rohit Sharma vs Kohli, we’re building up to this one, a keenly contest contest, something which we hope will set the tone for a good week!